Upwelling and winter convective mixing are the two major physical forcing mechanisms that regulate the biogeochemistry and biology of the eastern Arabian Sea (EAS). While upwelling is the dominant forcing mechanism in the south EAS during summer monsoon, convective mixing mainly regulates the north EAS during winter monsoon. Understanding the complexity and interplay of these two varying forces in different seasons and regions leading to distinctly different nutrient replete/deplete conditions and short/long-food chain is crucial for ecosystem management. Recurrent deoxygenation is a critical factor that regulates the EAS ecosystem. However, to what extent these changing environmental conditions influence the biogeochemistry and biological food chain that regulates the greenhouse gases and fishery resources of our country is still unclear. Although many studies have been carried out they are highly discrete and localized which can not address the basin scale effects. Addressing such issues is therefore possible only by syncing the basin-scale environmental conditions with biogeochemistry and biological oceanography by coupling air-sea and pelagic-benthic interactions for better understanding and management of marine ecosystem. 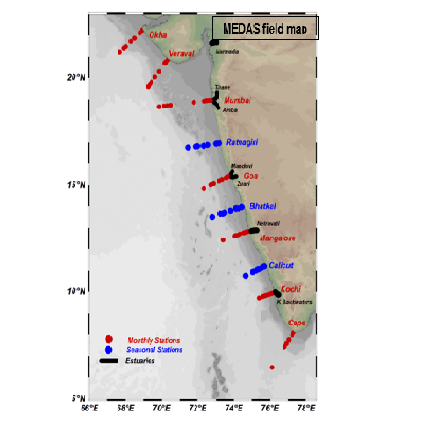 Biogeochemistry of eastern Arabian Sea through time-series approach. Interaction between upwelling and winter convective mixing. Relative influence of anthropogenic and offshore effects on shelf biogeochemistry. Effect of deoxygenation on nutrient cycles leading to greenhouse gases production. Biological response in terms of changes in trophic interactions due to varying upwelling source water characteristics. Pelagic-benthic interactions in trophic food supply and exchanges. 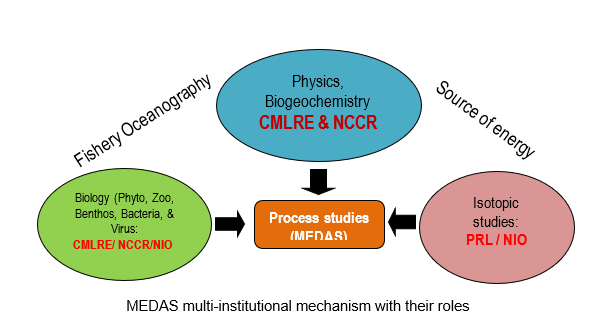 To effectively address these objectives through the outlined scope of works, the first-ever mega mission-mode basin scale time-series estuary-coastal-offshore integrated multi-disciplinary MEDAS studies have been implemented as a joint initiative between CMLRE and National Centre for Coastal Research (NCCR), Chennai in partnership with NIO (and PRL) by pooling their scientific personnel, resources, infrastructure and expertise. The massive field campaign works started on 22nd December 2017 have been successfully completed on 31st January 2019. The field campaign involved a total of 10 continuous cruises (8 on FORV Sagar Sampada and 2 on ORV Sagar Kanya) at 30-45 days interval and 3 times parallel surveys of major estuaries (Cochin backwaters to Narmada) all along the west coast of India. 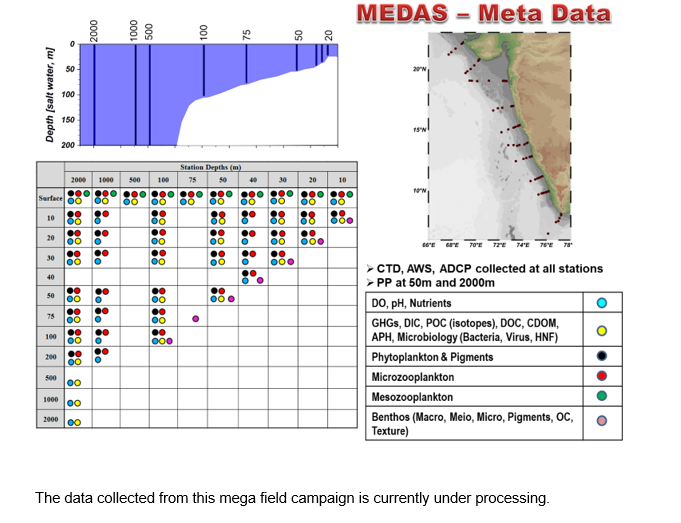 All through the field campaign, a total of about 300 field days have been spent within 13 months and repeatedly occupied 60-80 stations (in cruises), covered more than 800 stations/profiles and collected valuable data (following high precision methods) on physical, chemical and biological variables. Apart from CMLRE, NCCR and NIO, students from KUFOS and Berhampur University have also been associated in some of these cruises and underwent the best possible training. A total of 10 coast-offshore transects (30-2000 m) all along the eastern Arabian Sea have been occupied during these cruises (Figure 1). Out of them, 7 regular transects (off Cape, Cochin, Mangalore, Goa, Mumbai, Veraval and Okha) were occupied in all the cruises and 3 additional intermittent transects (Calicut, Bhatkal and Ratnagiri) were occupied seasonally (January-February, September-October and December) for high spatial resolution studies. The transects Cochin, Mangalore and Goa, being adjoining to port channels, were additionally occupied in the shallow (nearshore) stations 13 and 20m, and Mumbai and Okha were sampled up to 20 m station in all the cruises. Estuaries survey includes major systems viz. Cochin backwaters, Nethravathi, Mandovi, Zuari, Thane, Amba and Narmada during June and September (wet period), and December 2018 (dry period), parallel to the corresponding periods of cruises.